Formulated with pure Vitamin C this fluid is suitable for all types of skin, especially dull, sagging and tired-looking skin in need of a boost. 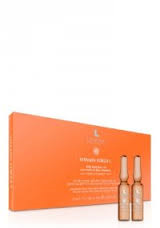 Pure vitamin C that protects cellular structures from the action of harmful elements such as free radicals. Apply one vial over the face and décolletage with a gentle massaging action. This treatment is compatible with the nourishing and moisturizing fluid from the Vitamin Forza C range.